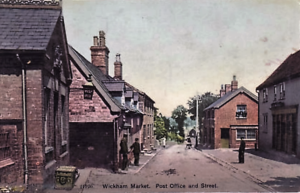 At its height in about 1910 Wickham Market had seven public houses serving a community at the time of 1,417. By 1999 all but one of these pubs closed, leaving the George as the last. 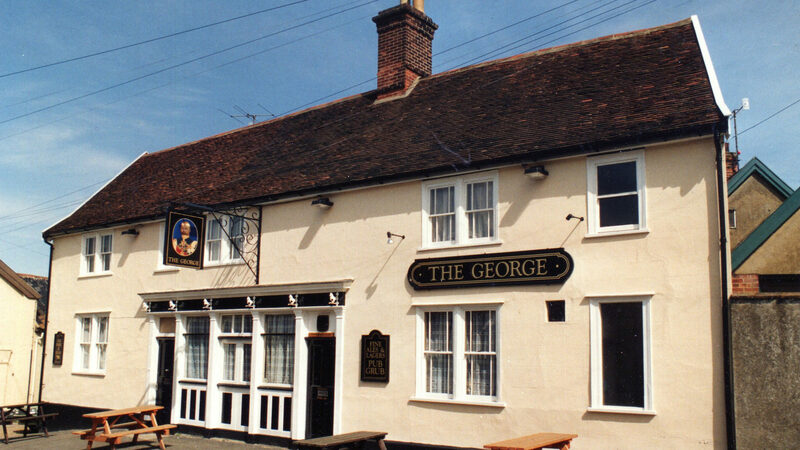 The George is one of the four earliest recorded inns in the village and is thought to date back some five centuries. So it is particularly sad that the last surviving pub is now gone. 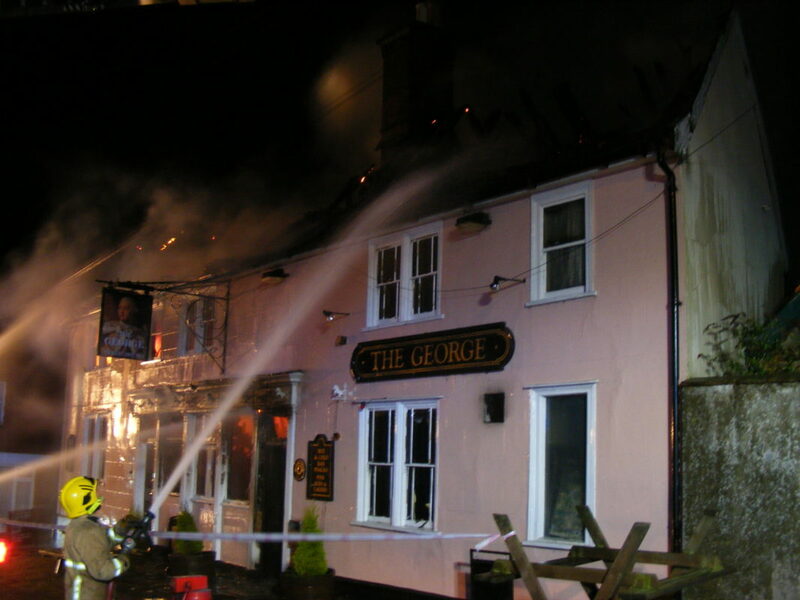 At the time of the fire in April 2013 it was owned by Punch Taverns and occupied by a tenant landlord. The overall impression is that it was very much underused by the local community and was, therefore, struggling as a viable concern. As a consequence, the building and facilities were not in good condition. 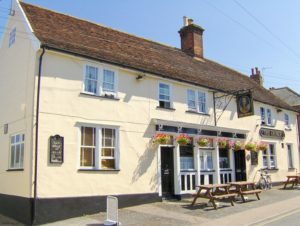 Structurally, the George, a Grade II-building, comprised, initially, a two-storey, five bay timber- framed building, probably built in the early 16th century. The building was in the local, East Anglian, tradition and had a crown post roof. 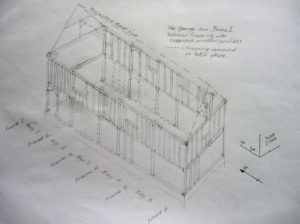 A separate, single bay timber-framed structure was subsequently (but probably not very much later) added to its northern end, possibly as a separate property. There is evidence that it originally had lower floor and roof levels and its roof may originally have been aligned E-W rather than N-S. Both properties appear to have had wattle and daub infill walls, of which some survived until the present day. A notable feature is the presence of a doorway at first floor level on the back of the building. One suggestion is that this would have allowed direct access to ‘guest rooms’ on this level and that the building was originally constructed with an inn in mind. In the late 16th or early 17th century brick chimney stacks were inserted at the east end of the newer, northern build and centrally in the original structure. The floor level of the latter was possibly also lowered at this time. During the later 18th and/or early 19th century a number of changes and additions were made. These included the linking together of the two earlier structures under a single N-S roof and adjustment of the first floor and roof levels of the northern one to do so; the internal re-framing of the southern bays appears also to have taken place at this stage; the rebuilding of the northern end/gable of the building in brick, and the construction of a basement (also in brick) under the northern bay, which left its floor level higher than the lowered floor of the main structure. Other changes to the earlier structures were the alteration and re-facing of the chimney stacks, with the insertion of new grates and, at least one, fireplace; the insertion of sash windows and the present timber-panelled central section of the frontage with its doors and window, the rendering of the remainder of the timber-framing, and re-finishing of the interior with lath and plaster. The building was also added to, to the rear, by the construction of a single-storey ‘lean-to’ in brick with its roof creating an ‘eaves room’ at first floor level. 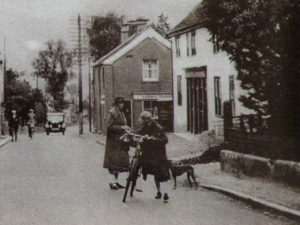 In the 20th century, maps show that a long, narrow extension had been built to the rear along the southern boundary of the site, but it was subsequently replaced by a games room and WC block, built of rendered concrete blocks which was granted planning permission in 1995. Elements of the of the original timber framing have, over time, been removed at ground floor level, particularly at the interface with the rear extension, as internal alterations were made. (Heritage Collective, 2015). 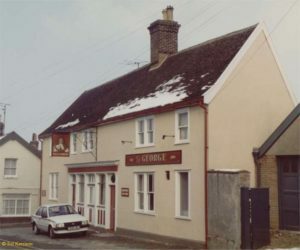 The 1984 Grade-II listing details for the George describe it as, "House now public house. Early C18. Timber framed and plastered with plain tiled roof. 2 storeys. 5 window range (one blocked): sashes in flush frames with glazing bars removed. Late C19 bar entrance with fixed light window and panels below; 2 boarded entrance doors. Fascia and cornice. Central brick stack." As shown above, however, investigations after the fire have shown it to be of much earlier origin and to have a much more complex constructional history, adding to the significance of what survives. This is reflected by the addition of the building to Suffolk County Council’s (historic) Buildings at Risk Register in 2014 and by the refusal, in September 2016, of planning consent for its demolition. The fire-fighters managed to control the blaze after several hours, but were still dampening down the next day. 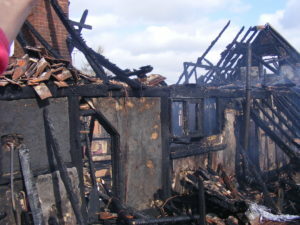 The cause of the fire was treated as suspicious and a joint investigation was mounted by the Fire Service and Police. The reason officially recorded by the Fire Service was: “Heat source and combustibles brought together deliberately”. Immediately after the fire, an amount of work was done to stabilise the structure and remove fire debris, though a significant quantity of historically important timber has been recorded and retained for possible reconstruction purposes. The majority of the roof was destroyed by the fire, although some remnants of the historic crown post structure survived, albeit in a heavily charred condition. Although the building is effectively a shell, a large proportion of the timber-framing, comprising the outer walls, internal cross frames, first floor and eave ties have survived sufficiently to allow repair and reconstructive work and the charred timbers can be cleaned. Perhaps, surprisingly, considerable areas of wattle and daub infill have also survived, with varying degrees of fire damage, and can also be retained. Other elements, including the chimney stacks and northern brick end gable are capable of being incorporated into a reconstructed building. 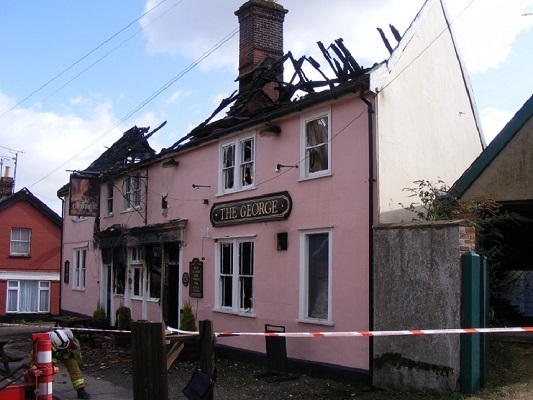 Overall, independent conservation engineering advice taken by Suffolk Coastal District Council indicates that “the fire-damaged building was capable of retention and reinstatement”. The building is currently protected by a scaffold and corrugated iron roofing structure, but it is inevitable that there will be deterioration over time. 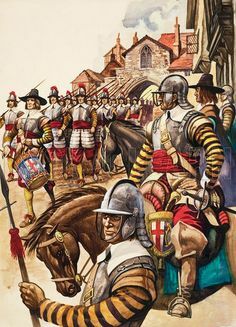 The George was probably well over 100 years old when, in 1652, the Churchwardens recorded the expense, met by the community, of the billeting for a night of ‘... 9 soldiers at 4d a man at The George.’ Other soldiers were put up at The White Hart, Crown, and Blue Boar inns. It is possible that they were ‘en route’ due to the First Anglo-Dutch War, which started in March 1652. In 1746, on the death of the then tenant landlord, Thomas Stevenson, an inventory of his effects shows the inn as consisting of a parlour, hall, kitchen, pantry and cellar, with (upstairs) a parlour chamber and furthest chamber (bedrooms). The inn also had a ‘bruing office’ (brewery). 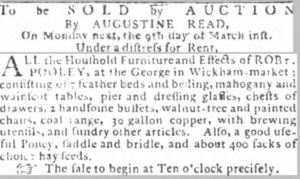 Two years later, the tenancy of the inn, which also included about 3 acres of land and a barn on the south side of George Lane, stables and some tenements (houses) was let for £20 a year. It was owned at this time by the Cottingham family of Framlingham. Places of ‘assignation’ for horse breeding! The Blue Boar: pre 1652 – ? 1771 – Bef. 1795: James Brooks? 1840 - 1841: Mary Ann Girling? 1975 – 1992: Malcolm Lankester, Esq. 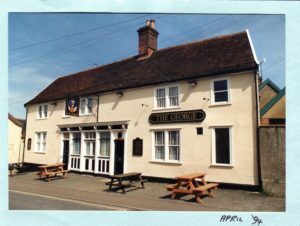 If you have any new facts, memories (or photographs) of The George, characters associated with the pub or groups that used it you wish to share, then please contact us. We would particularly like to hear from you if you are, or think you might be, related to previous landlords or landladies of The George.